Benjamin was the son of Russian Jewish immigrants, his father presumably taking the name "Sackett" upon immigration to the United States. War against the United States did not start with the Japanese attack on Pearl Harbor. It had been in active progress for over two years. Our internal enemies—agents of Japan, Germany, and Italy had been unceasingly active. So charges the report of B. Edwin Sackett, former special agent in charge of the New York division of the F.B.I., whose detailed report of smashing the Nazi spy ring appears in the March issue of Cosmopolitan magazine. Sackett describes in his article the roundup of the largest group of espionage agents in America history, 33 in all, who were trapped by thorough-going, meticulous work of the F.B.I. With them worked William G. Sebold, a German-born, naturalized American citizen who was trapped by the Gestapo on a visit to his homeland. The German secret service enlisted the services of the one-time aircraft mechanic to obtain detailed plans of American defenses. But they were foiled. Once he was back in New York, Sebold told his story to the F.B.I., and their collaboration resulted in the startling expose last June. Sackett relates how Sebold was given detailed instructions when he left Germany. Included were plans for a short-wave set direct to Germany, names of secret agents to contact in New York. These instructions Sebold carried out, but with the full knowledge of the F.B.I. Sebold, Sackett says, met the secret agents, talked with them and gave them spurious information. But each meeting was recorded by F.B.I. motion picture cameras, cleverly concealed. Further counter-espionage efforts included constant surveillance of dozens of people; secret codes; invisible inks, micro-photographs the size of a pinhead. And after a year and a half's work, the agents were trapped. The case was airtight. The jury found all the defendants guilty. The largest espionage ring in America's modern history was finally liquidated—the American way—through a fair trial before a jury instead of death before a firing squad." —The Denison Press (Denison, Texas), 19 Feb 1942. US Social Security Administration, "Social Security Death Index", database, American Ancestors, "B Edwin E Sackett, b. May 15, 1911, d. Oct 25, 2002, SSN 313-20-1536 issued IN, residence Greenwich, Connecticut, 06831, county Fairfield." 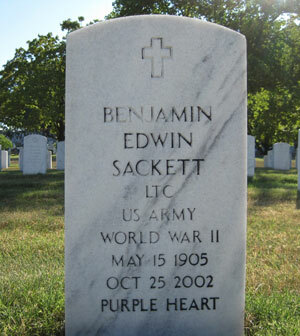 "U.S. Veterans Gravesites", database, Ancestry.com, "Benjamin Edwin Sackett, LTC US Army, World War II, b. 15 May 1905, d. 25 Oct 2002, bur. Arlington National Cemetery, 9 May 2003, section 67, site 4058, service start date 29 Jun 1943." Sackett, Robert L, 1/12, b. NJ, father b. Russia, mother b. Russia. B. Edwin Sackett, special agent in charge of the New York Division of the FBI, today announced his resignation, effective Nov. 13. Sackett said he had "yielded to the importunities of my family to enter civilian life." He added he was ready to answer any "call" the Government may make in the present emergency. He has served in the FBI for 13 years." The Denison Press (Denison, Texas), digital image, University of North Texas, Texas History (http://texashistory.unt.edu), 19 Feb 1942, "Spies Active for Over Two Years."